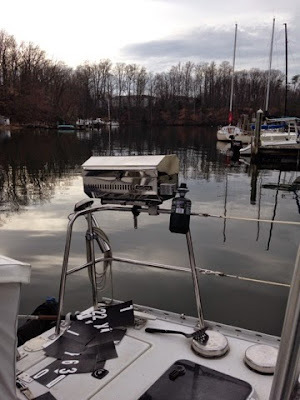 Day 7 (Tuesday): We took our first dinghy ride this morning with the new outboard. 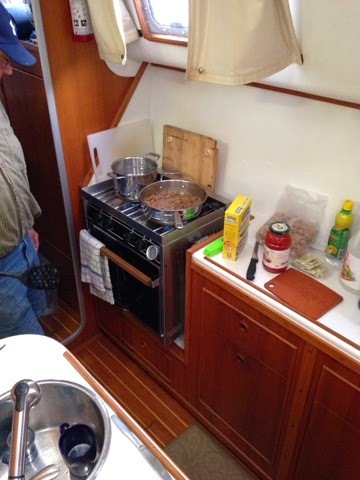 Then the Captain did an exterior boat scrub down and put the repaired genoa back on. 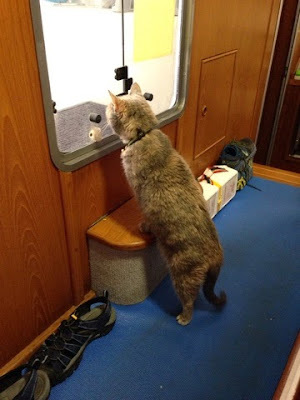 After some more cleaning (galley is officially stowed/organized) and errands (yep, West Marine), the first mate took the helm of the dinghy and received a grade of "perfect" (no one swam and no boats were damaged). We capped the evening off with our first hot dinner cooked on the propane stove. Things are coming along. Day 8 (Wed): It's a rainy & cold day. A few chores & errands are completed including putting taking the old registration numbers off the sailboat & dinghy and putting the new on. Laundry was done, thanks to Amelia the cat throwing up on the bedspread (there is something to say about laundromats. 4 loads in an hour--high capacity commercial machines are definitely faster!) The rest of the afternoon was spent on the settee watching movies with drinks & snacks. It's starting to feel like home around here and the project list is turning into a to-do list. Starting to plan for leaving the marina. 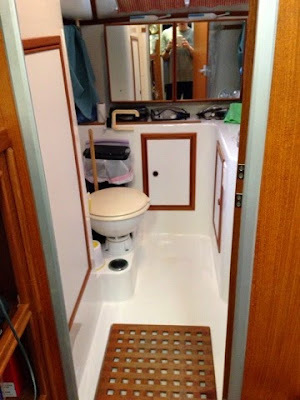 Day 9 (Thurs): The holding tank light came on so we're going to have to leave the dock to pump out soon or forever walk to the marina bathroom. Captain had both propane tanks filled and did battle with the roller furling again. I picked up our Honda Generator & our Amazon shipment. The new shower curtain arrives, so the head gets a thorough cleaning and then we take hot showers (the hot water has been working for a few days, but we finally got brave). We haven't quite got the hang of it yet, but a hot shower at home then straight into pajamas while Big Bang Theory is on feels good. The Captain came back from West Marine with a fitting for the baby stay, a Magma grill, more line for the roller furling & misc other toys. A big Amazon box came to Sail Away with some binoculars & walkie talkies. Probably time to quit shopping and start sailing. "Hey, what are you guys doing out there?"